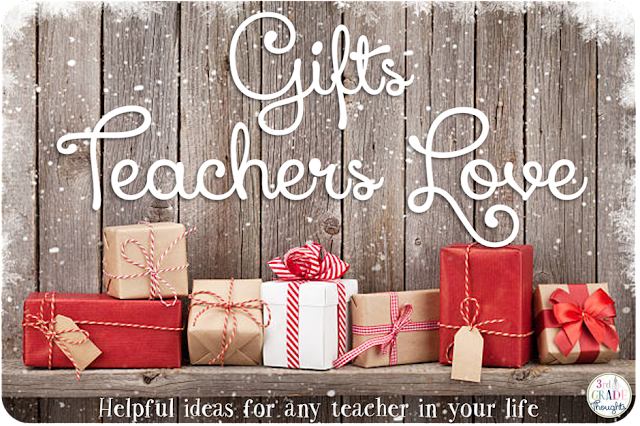 It's getting close to Winter Break and, chances are, you have some favorite teachers to buy gifts for. 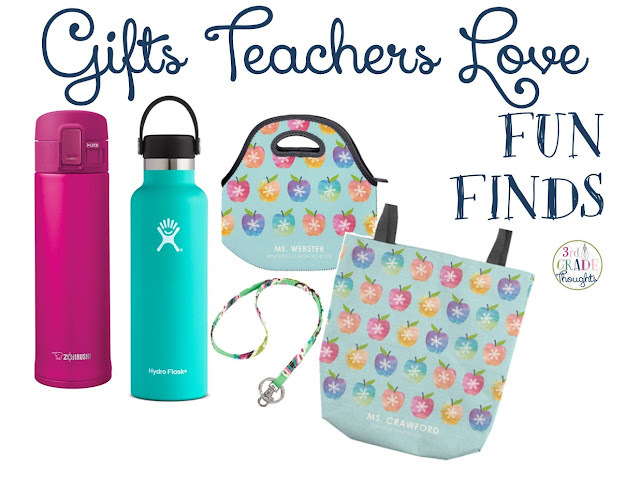 While any gift is never expected and always appreciated, there are definitely some gifts that make our teacher hearts go pitter-patter! I've compiled a list of my favorites below with links to Amazon and other retailers that can help get these into your hands, or your teacher's classroom, as soon as possible before the holidays! We teachers are a weird breed and actually *love* things that we can use in our classrooms! Not many professions can say that, but any of the top teacher-favorites below will definitely be a hit. Writing supplies are not just a favorite, but a daily necessity, so getting the type your teacher prefers is always a hit. Flair Pens are always a go-to, along with color Sharpies and Mr. Sketch scented markers. Plus, if they have a whiteboard, Expo markers in many colors are a must. If your teacher is in need of pencils, and all teachers always are, Ticonderoga are the best, and bonus points for buying the pre-sharpened variety! 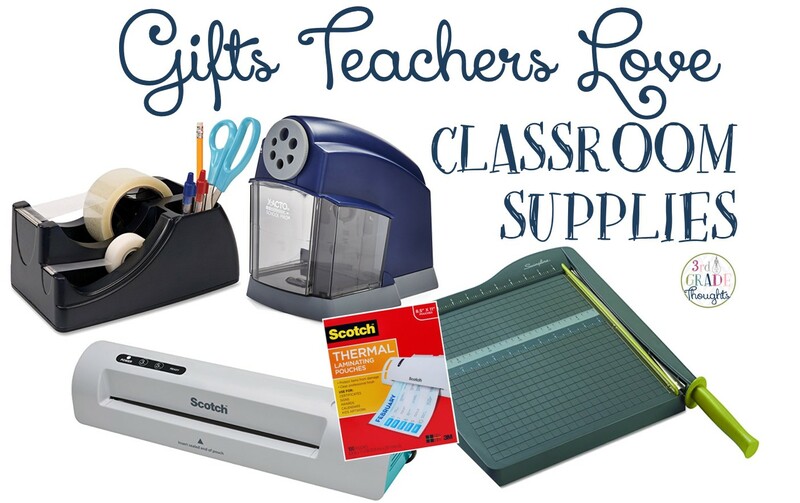 If you're looking to spend a little more and purchase some favorite workhorses for the classroom, you can never, ever go wrong with a personal laminator. 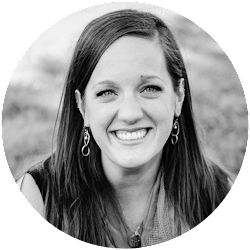 Chances are, if you live with a teacher, you are all too familiar with the mountain of plastic-covered task cards, signs, game pieces, and more that you have seen your teacher cutting into all hours of the night. These personal laminators are thicker than regular laminating film and allow your teacher to watch Netflix and laminate, maybe with a glass of wine or hot tea, so you will score major bonus points! Remember to pick up extra pouches, since suddenly everything will need to be laminated, trust me. After all of the laminating is done, how cool would it be for your teacher to have their very own paper cutter? This little guy lives in my office and gets a workout every new unit when I am on a laminating and cutting spree. It saves me from trying to cut a straight line, and it is very zen to hear the slicing sound through the stacks of task cards. This particular style is slim and slides into a cabinet when I'm not using it, so it's also not a safety hazard with my daughter in the house. Although it may seem dorky, a pencil sharpener (that works!) is a miracle tool in the classroom. This has been my version for the past two years and it's still sharpening strong. And this tape dispenser, although a random supply, is so incredibly useful! Your teacher probably uses a lot of large, clear tape for hanging things or rebinding books, so to have it at-the-ready is a pleasant convenience. 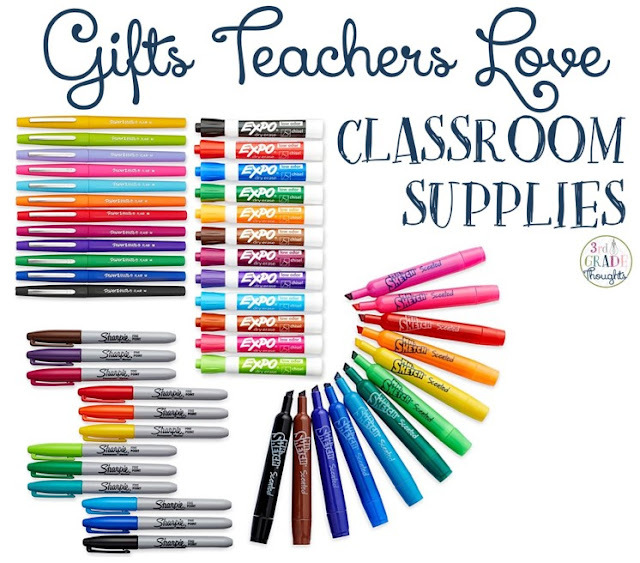 If you aren't too sure about investing in classroom supplies, gift cards are always a welcome treat for any teacher in your life. We tend to forget to treat ourselves to movies, sit-down restaurants, or even fancy cups of coffee throughout the school year, so these always give us the perfect excuse to get out of the house on a Friday night and have some grown-up fun. Target and Amazon are favorite store cards, although depending on your teacher, spicing it up with an iTunes, Sephora, or even Lowe's card can be an unexpected treat. The year I bought my first house, parents in my classroom surprised me with a home improvement gift card and it helped relieve the stress with all that a new house entails. Even though gift cards can get a bad rap for being "impersonal", they can really both a thoughtful and useful gift, and very much appreciated to any teacher in you or your child's life. 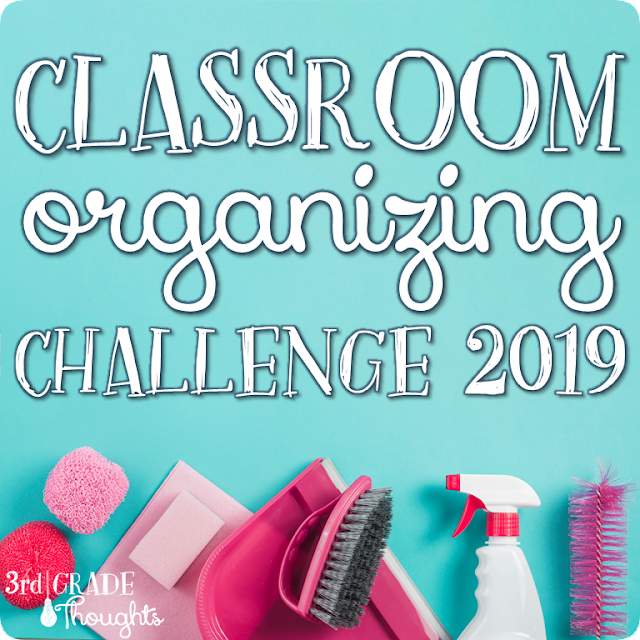 It can be hard to think about personal items that a teacher may or may not have in their collection already, but I've gathered some fail-proof ideas that will always be a welcome surprise. If your teacher is a beverage-drinker, you can't go wrong with these two vessels. They keep drinks both hot or cold for hours. My personal favorite for my coffee is the Zojirushi mug. It will truthfully keep coffee piping hot all day long, it's crazy! If you know your teacher prefers cold water or iced tea, the Hydroflask is an amazing design that will keep the drink so cold, ice cubes stay inside all day long. Maybe your teacher is in need of a teacher bag or lunch tote? 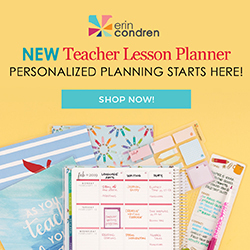 Why not get coordinating and personalized options from Erin Condren? These are what I use on a daily basis and I love how sturdy and roomy they both are. Plus, their fun designs add some flair into the day. Teachers these days have to carry around a lot: an ID card, keys, whistle, and sometimes a key fob. A great gift that can always help them keep organized is a wristlet, lanyard, or zip. These are not just decorative, but functional, so they will be put to good use right away. I'm sharing some of my favorite Erin Condren goodies below. These are always add an amazing touch to items that are already needed, like clipboards, file folders, notepads, and more. Personalizing the designs and names make these gifts go above and beyond. Even if you find there isn't enough time for Christmas gifts, keep these in mind for the end of the year. 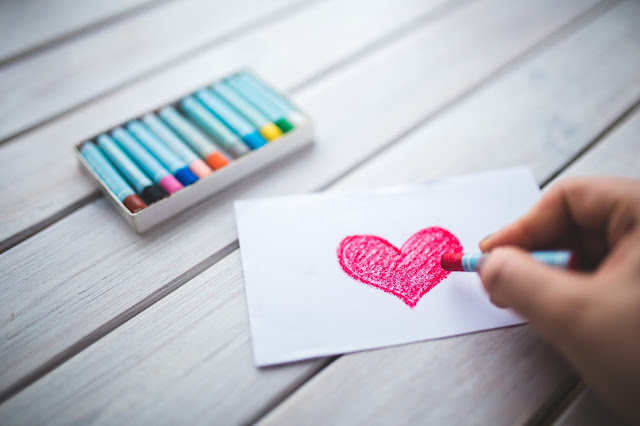 If you are a parent reading this to get ideas for your child's teacher, always remember that nothing, seriously, nothing is more meaningful to receive as a teacher than a thoughtful note or card from your child. Even better if it's homemade and illustrated! Gift cards, pens, and lanyards are all nice, but they certainly are not the reason we do what we do, nor are they even expected. This season, please know that your child's teacher is including each and every student in their reasons to be grateful for this year. Your kids are our family for nine months each year, and there is no better present than that. A fun-filled day out with my sisters when I was feeling down was a very special gift. Handmade pot holders from my 10 yr old daughter. She workrd so hard and picked out the fabric specially for me. An ornament dated with my student's name and the year. It was my first class. I think of her every year when I decorate the Christmas tree. I still remember getting tickets to the Sound of Music when I was 10 for Chanukah. My sister and I were so excited, began a tradition of a day in NYC during the holidays. Taking me out for breakfast, lunch or dinner ~ or an experience! You give amazing suggestions! One of the most thoughtful gifts I have received was an early gift of wrapping paper, tape, ribbon, tags, etc. Everything I needed to get gifts ready for my own family! One of my students made a donation in my name to our local community outreach with a handwritten card saying that they wanted to honor the difference I made in their child's life with a gift that would make a difference in the community. As a teacher, I always love getting drawings and hand written notes from my students. After last year's state tests, I received one from a third grader who thanked me for believing in him and letting him know he could do it! I gave my kids' elementary school teachers goody baskets each year and included a thoughtful, handwritten card that thanked them for all of the ways they went above and beyond for my child that year. The most thoughtful gift was a thank you card from a first grader! As a teacher, I truly do love those thoughtful little notes from students. They are always so sweet and kind! My most thoughtful gift was a card from a past student with such kind words. It was so heartfelt and wonderful, there is nothing better than that! I received a small matchbox-sized music box. I'm a music teacher So I appreciated getting a gift that related to my subject area. My husband tracked down a copy of a cd of one of my favorite artists that I could not find. My mother in law modpodged pictures of me, my husband, and our first born (a month old) on a metal star. I’m slightly obsessed with 🌟. I was an emotional mess. It was perfect and is still the centerpiece of my star wall.